The American people and their representatives are guilty of dereliction of duty when it comes to the failure to impeachment the criminal in office, Barack Hussein Obama, as well as this criminal administration. America is adding strength to tyranny by giving permission to destroy for yet another two years. These criminals and their crimes in this administration are not hidden (Luke 12:2-4, 2 Corinthians 11:14). They are being uncovered on a daily basis in the face of the American people. It is the responsibility of the American people to respond to the crimes that are being committed. The people in this country know exactly who the guilty are, as well as the crimes they are committing. America’s representatives are violating the oaths that they swore to uphold. America does not need another debate or play on words to know what their responsibilities and duties are. The borders are wide open; ISIS fighters are given permission to return to the United States after battling America’s allies; and this president is in known alliances with America’s sworn enemies. Our forefathers left America with the example of what not to tolerate, namely a tyrant named George. The Declaration of Independence is the history of a people who would no longer suffer “a long train of abuses” by a tyrant who would not rule in accordance with God’s government (Exodus 18:21). So, instead of jeopardizing the future for their posterity and their blood-bought freedoms, they threw off an ungodly tyrant! Which one makes sense? Throw off the Constitution, or throw off the men that pervert the Constitution? Sounds pretty simple to me. The knowledge you have now been given should move your feet to action so that you are not found to be a criminal against God, your people or your country (James 2:14-26). 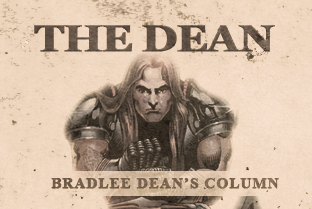 Listen to Bradlee Dean on the radio six days a week at SonsOfLibertyRadio.com and get the news that state run media won’t give you at SonsOfLibertyMedia.com!